For those who always dreamed of a romantic fairy tale wedding, Hilton Lake Las Vegas Resort offers exactly what you imagined. 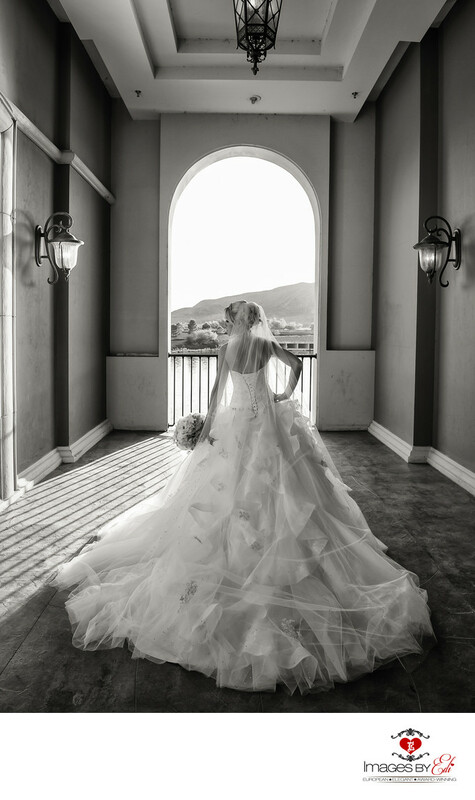 The Mediterranean styled architecture, the Italian inspired Pontevecchio bridge with beautiful views of Lake Las Vegas and the Mountains provided background for this beautiful black and white bridal portrait. The ceremony was held at the Mediterranean-inspired The Capella Di Amore wedding chapel, what is just across from this arch. She is wearing a beautiful princess dress. Her beautiful bouquet was created by the talented Petals Flowers and Events. Keywords: Bride alone (150), Hilton Lake Las Vegas Wedding Photographer (33), Hilton Lake Las Vegas Wedding Photography (33), Images by EDI (300), Las Vegas Wedding Photographer (624), Las Vegas Wedding Photography (642).